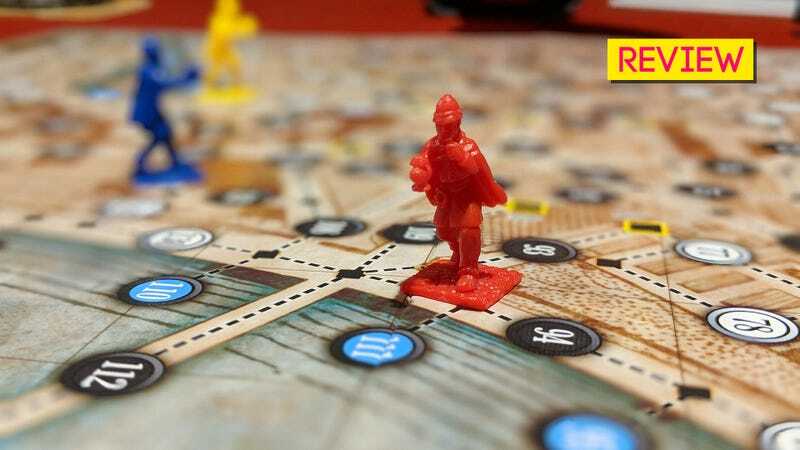 In 2011, the board game Letters from Whitechapel put detectives on the hunt for Jack the Ripper. In 2017, that game has been stripped down to all but its most essential systems, and has become better for it. Whitehall Mystery is the name of the new offering. Made for 2-4 players, it puts one person in control of Jack the Ripper, while everyone else takes charge of London cops running around the streets trying to find him. The player controlling Jack has 15 turns to complete four murders, and is able to move around the map invisible to the eyes of the police. The cops, meanwhile, are blundering about the streets in plain sight, but have the advantage of being able to work as a team. Here’s how it all works: as you can see above, there are two types of marking on the map’s streets, numbered circles and black squares. The police can only move between the small squares, while Jack can only move between numbers. Being visible on the map, moving the police around is fairly straightforward. Because Jack is hidden, though, he gets to be more cunning; with a screen obscuring some paper from other player’s view, he plots his progress by noting which circles he has moved to, leaving an invisible trail. It’s up to the police to find this trail by moving to squares then, like an “’allo ‘allo what ‘ave we ‘ere then” version of Battleship, calling out asking whether Jack has visited the adjacent circles. If he hasn’t, nothing happens. If he has, he places a marker on that circle. This means the police have found his trail, but they don’t know where exactly he is; he could be long gone from that spot, or he could be literally standing right on it. Jack’s in black, the other characters are the police. When the police players feel they’re close enough, they can risk attempting an arrest on a circle; if Jack is on it, they win the game, but if he’s not, they’re unable to call out for any more circles that turn, potentially slowing down and even crippling their investigation. Once Jack’s trail has definitely been found, the game stops being about policework and starts to feel more like frantic fumble in the dark, as the police players try and triangulate Jack’s position while closing in on him, alternating between sounding out for his presence while attempting arrests. So, yeah, it’s a lot like Marco Polo, only about a murderer. What I liked about the game was the fact it rarely feels “over”, even if you’ve lost hope. Jack has 15 turns to complete four murders, but is mandated to commit one crime in each quarter of the map, so even if your searches have turned up nothing for 3/4 of the game, the police are still able to narrow their focus and be in with a fighting chance of catching him before the end. Jack, meanwhile, gets to sit in the corner and be a smug prick for the entirety of the game, knowing that even if the police really round on him, with only three of them on the map he still has a very good chance to slip out through their grasp. And it’s devious fun getting to be the only one who knows exactly where you are, especially as you’re slipping between the sweating and oblivious police. The best part is probably the smooth, state of tension the game generates. Knowing Jack is out there, somewhere constantly tugs at the police, especially so as the game draws to its conclusion, but because the turns move so fast you never sink into a greater sense of anxiety or helplessness. It’s not a wild ride, just a generally pleasant one. Everything in Whitehall Mystery is very fast and very simple, an almost perfect execution of some really simply mechanics, so much so that I was playing it thinking it was a game I’d really love to play with kids...if the setting wasn’t focused on a serial killer who cut open prostitutes. But it is, so until they’re older it’ll just be something I play with my friends. Which given its quick and easy nature—and the fact it only takes around 60-90 minutes to play a game—is something I think I’ll be doing quite a bit of in the coming months.